In today’s conversation, I sit down with a legend in the world of finance, Mr. Roger Ibbotson himself. In 1977, Roger published the first edition of Stocks, Bonds, Bills, and Inflation, a collection of historical returns dating as far back as 1926 – in a sense, he was ahead of his time as no one had compiled this historical market data all in one place before, in a way that was easy to understand. Based on the positive response from this landmark study, he founded Ibbotson Associates in the same year which he later sold to Morningstar in 2006 for $83M. Roger is currently Chairman and CIO at Zebra Capital Management and he has also served as a Finance Professor at the Yale School of Management for 30 years. Today we dive into his most recent work, a whitepaper titled “Fixed Indexed Annuities: Consider the Alternative.” In it, Roger examines how today’s historically low interest rates and bond returns are putting many retirees in danger of not producing enough income from the fixed portions of their portfolios through retirement. He gets into the biases both consumers and financial advisors often have when they hear the word “annuity” and why his math shows that fixed indexed annuities may prove a viable alternative in many retirement portfolios. [05:18] Roger’s story on how he built a database in 1977 that ended up becoming Stocks, Bonds, Bills, & Inflation and launched his company Ibbotson Associates. [11:32] Why it’s so crucial to shift your clients’ portfolios away from market based returns as they approach retirement age and how the industry standard bond/equity mix might not be the best answer in the future. [12:24] Reasons the bond market has become less and less appealing over the last several decades as a way to de-risk portfolios—and what to do about it. [34:08] Why many clients expect markets to continue to behave in the future as they have in the past – whether that’s the current bull market and believing the market will continue to go up forever or a bear market similar to the financial crisis of 2008 and 2009 where investors are permanently scared to safety. [44:45] how bond performance since the Jimmy Carter days has been similar to Michael Phelps swimming with the current and the challenge of creating bond yield in an increasing interest rate environment. I promise this will make you laugh! [09:46] Why the markets became volatile again – and the impetus for Roger’s whitepaper. [10:58] What makes human capital almost like a bond – and the reasons young people should load up on equities. [14:29] Why there’s a stigma in the industry around annuities when it comes to asset allocation. [15:51] The two forms of indexed annuities – and why fixed indexed annuities are a potentially great retirement asset. [18:09] How even treasury bonds can show returns as low as -5% as a result of changing interest rates. [20:25] The reasons fixed interest annuities have better risk characteristics than bonds. [29:62] The surprising numbers Roger discovered when looking at a variety of mixed portfolios. [32:54] Why right now is an especially bad time to buy bonds – and the reasons to consider fixed interest annuities instead. [34:08] The irrational reasons that so many clients expect markets to continue behaving exactly as they have, despite hundreds of years of volatility. [39:06] The reasons you need a trusted advisor to work in your best interests – and not just on commission. [42:07] Roger outlines the dangers of investing in bonds as a way to de-risk your portfolio. [43:45] Why investing in bonds is a little bit like swimming against the current. [46:16] What Roger did before he founded Ibbotson Associates. [47:56] Roger shares his first memories of money – and the first stock that he bought, with his father’s help, when he was 16. [52:48] Why Roger avoided hot stocks – and instead chose “cool” ones – to build the Zebra Index. [53:48] The new book Roger is writing right now – and how popularity can tie virtually any two things together. [55:39] Why Roger thinks it would be absurd if bonds outperformed stocks over the next 25 years. [58:44] How being a part of academia has proven key to Roger’s success. Thanks for checking out the latest show! I really appreciate the reviews as it helps me figure out which guests resonate with you all and helps the show get discovered! Max, thanks for the review and kind words, it’s fun to see reviews from a mix of industry veterans as well as those who are just starting out like yourself. Some words of advice to live by, focus on always serving your clients first and success will follow, good luck on your journey! Thank for the kind words and taking the time to leave the show a review! Jim Sheils Family Boardroom framework has been one of the best things I’ve ever done as a dad, so I love that you are running with it! The biggest key to success I’ve found is to simply schedule the first meeting on your calendar and once you do one, you won’t stop as it’s such an incredible experience with your kids. Good luck and drop me an email to share feedback once you’ve done one! Thanks for the review rweichman! The Process vs Product episode consistently ranks as one of the show’s top 3 most downloaded episodes, so glad to hear it got you thinking as well. This is a framework we’ve helped our clients from all over the country implement, trademark, and integrate into their appointment process to give them a competitive advantage and keep them from being a commodity in their own market. So if any of you are listening in out there and need help with this, visit the website and hit the “Work With Us” button at the top of our page if you’d like to apply for a coaching session focused on Process over Product. Thanks for listening in Perry! Love that the show’s a staple of the morning drive to the office. Appreciate you taking the time to leave us a review as well! [00:00:25] Brad: Welcome to the Elite Advisor Blueprint, the podcast for world-class financial advisors. I’m Brad Johnson, VP of Advisor Development and Advisors Excel and it’s my goal to distill the best ideas and advice from top thought leaders and apply it to the world of independent financial advising. In today’s conversation, I sit down with a legend in the world of financing, Mr. Roger Ibbotson himself. In 1977 Roger published the first edition of Stocks, Bonds, Bills, and Inflation, a collection of historical returns dating as far back as 1926. In a sense, he was ahead of his time as no one had compiled this historical market data all in one place before in a way that was easy to understand. Based on the positive response from this landmark study, he founded Ibbotson Associates in the same year which he later sold to Morningstar in 2006 for $83 million. Roger is currently Chairman and CIO at Zebra Capital Management and he has also served as a finance professor at the Yale School of Management for 30 years. Today we dive into his most recent work, a white paper titled Fixed Indexed Annuities: Consider the Alternative. In it, Roger examines how today’s historically low-interest rates and bond returns are putting many retirees in danger of not producing enough income from the fixed portions of their portfolios through retirement. He gets into the biases both consumers and financial advisors often have when they hear the word annuity and why his math shows that fixed indexed annuities may prove a viable alternative in many retirement portfolios. Here are a few highlights that we get into. First, Roger’s story on how he built a database in 1977 that ended up becoming his seminal book, Stocks, Bonds, Bills, and Inflation and launched his company, Ibbotson Associates. Next, we cover why it’s so crucial to shift your clients’ portfolios away from market-based returns as they approach retirement age and how the industry standard on equity mix might not be the best answer in the future. Then we get into the reasons why the bond market has become less and less appealing over the last several decades as a way to de-risk portfolios. More importantly, what you can do about it. [00:02:30] Brad: From there, we get into some behavioral finance and why many clients expect markets to continue to behave in the future as they have in the past. Whether that’s the current bull market and believing the market will continue to go up forever or a bear market, similar to the financial crisis of 2008 and ‘09 where investors are permanently scared to safety. Lastly, Roger and I end with one of my favorite exchanges in our show’s history where he surprises me with a twist on analogy of how bond performance since the Jimmy Carter days has been similar to Michael Phelps swimming with the current and the challenge of creating bond yield in an increasing interest rate environment. I promise his analogy will make you laugh. Okay. 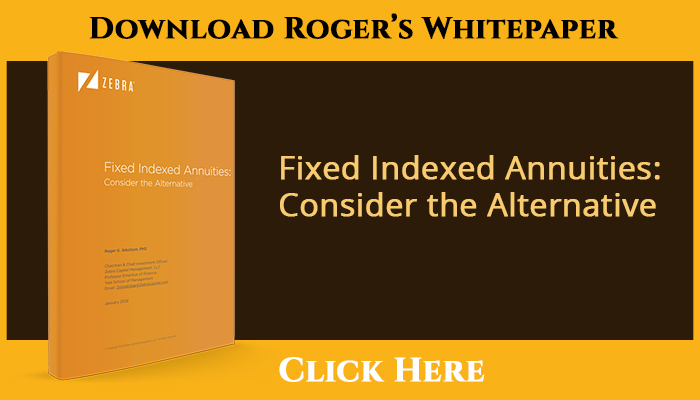 Before we get to the show, Roger went above and beyond for all of you Blueprint listeners by offering you a free download of his just-released white paper, Fixed Indexed Annuities: Consider the Alternative. It’s available at BradleyJohnson.com/45. As always, show notes that include links to all the resources, books mentioned, and people discussed are available there as well. So, that’s it. As always, thanks for listening in and without further delay, my conversation with Roger Ibbotson. [00:03:42] Brad: Welcome to the Elite Advisor Blueprint. We have a very, very special one here today. We have Roger Ibbotson, Chairman, and CIO of Zebra Capital Management with us. Welcome to the show, Roger. [00:03:56] Roger: Glad to be here. [00:03:57] Brad: Well, I’m humbled to have you on the show and I have to give a special thanks to my friends over at Annexus that really were matchmakers on this conversation so thanks to Ron Shurts, Don Dady, Eddie and Andy over on the team. They got us connected here and we’re going to dive deep on indexed annuities today which I have to ask you, did you ever think in your story and career studying the market, you’d be diving on a podcast talking about indexed annuities. [00:04:23] Roger: Well, I really didn’t even know what they were quite a while ago when I worked on Stocks, Bonds, Bills, and Inflation. So, I guess no, I did not ever think that but now that I’m getting into this, I can see the needs for it. [00:04:36] Brad: Well, great. We’re going to dive deep so I have to say I always do research for my shows but when you pull up a guy’s Wikipedia page and it says American academic, you know you better really do your homework so I’ve spent a lot of time digging in on all of the studies and the statistics you’ve done and there was something that popped up. Before we get into your white paper which we’re going to spend the bulk of the conversation on, I just had to ask you because I was curious, so you founded Ibbotson Associates in 1977. I got that right, didn’t I? [00:05:08] Brad: Okay. And then in, let’s see. One of your competitive advantages was you created this database that stretched to all the way back to 1926 included long-term capital market returns and I’m just so curious because I feel like I’m old because back when I started I was using fax machines to communicate. You’re creating databases back in 1977 of all of this market data so I just have to hear the story. How did this come to be? What drove you to create something that probably didn’t exist back then? [00:05:40] Roger: Well, first let me say I didn’t actually collect the data in 1926. I’m not that old but, yes, you’d be right. It wasn’t until the late 1970s and really there were these studies by James Laurie and Larry Fisher at the University of Chicago that showed what happened to the stock market over long periods of time, but everybody asked them to update those studies and they really never got around to updating those studies and people wanted to know how the stock market had done. So, that’s what brought me into this whole game here because it was such a need. People at the time had no idea what happened to the stock markets over the long-term. And then also we were so interested in risk at the time and so we went and compared them to bond markets. And so, people had no idea about the difference between stock recurrence and bond recurrence over the period as well and everybody was talking in academics about risk premiums so that should be some extra return from the stock market over the bond market. And so, we just didn’t have the data at the time so that’s what gave me the impetus to put this data together in the form which was your books and software and so forth build around stocks, bonds, bills, and inflation and that actually became the impetus to starting up Ibbotson Associates. [00:07:03] Brad: Wow. What was that like? I mean, you’re 1977. Are you in libraries, just flipping through all types of old charts? How did you go about doing that? [00:07:13] Roger: Well, fortunately, I was at the University of Chicago and a lot of the data was there in libraries but part of it was on computer and so forth and I’ve nearly had to process a lot of this data because the data was actually really available, just hadn’t been processed. So, yes, there was a real need and once it was done, people could understand the relationship between stocks and bond markets and inflation and all those premiums that got out of the things like the small stock premium, what they call the equity risk premium, with the stock versus bonds there or the horizon premium, how long-term bonds do relative to short-term bonds or one of the real interest rates, how things compare with inflation. So, all that data came out of it and really it was a forerunner, for now, all these data is routine and everybody just thinks it’s been around forever but really it wasn’t around before we really did this in the late 1970s. [00:08:09] Brad: So, you essentially were the original Yahoo Finance before it existed then, right? You’re the guy compiling all this stuff that people had because it wasn’t just go out to Google and type in a stock ticker. You literally had to go back and compile all of this research because people just had never done it before? [00:08:26] Roger: That’s right. I put it together and there was so much interest in it. I couldn’t handle it. I was a professor at the University of Chicago, but I couldn’t handle all the request for this and that’s why I set up my firm Ibbotson Associates at the time which by the way later was sold to Morningstar in 2006. [00:08:44] Brad: Yes. And so, let’s dive deep into really I call your newest frontier which is FIAs. And so, for those listening in, I’m actually holding it up to the camera, so you just released this white paper, Fixed Indexed Annuities: Consider the Alternative, and what’s interesting just the timing of what’s going on right now, you couldn’t have timed this white paper I don’t think. I mean you’re the academic, but I don’t think you could’ve timed it a more important time when you look at what’s going on out there right now. I just pulled an article from Financial Advisor Magazine and it said earlier this year, I think it was January or February when the market volatility finally came back that it had been missing all of last year. Typically, as you know, there’s a flood to safety to bonds and they said this was the first time in a number of years where the Barclays aggregate bond index was also dropping at the same time where all of this volatility was going on, on the equity side. So, can you speak to what’s going on out there and I think that’ll be a nice transition into really what you uncovered in your white paper here? [00:09:47] Roger: That’s why that I wrote the white paper because we sort of saw a need here because the investors really wanted to be part of the stock market in many ways. We had certainly recognized that and saying in Stocks, Bonds, Bills, and Inflation that stocks outperform bonds over the long run, but investors are really afraid to participate completely in the stock market because there’s talk about maybe they’re overpriced, they’re getting more volatile. So, they want to participate but they’re afraid to really go all in and they wanted to find another way of doing it. Now, the other thing that I really studied here was the approaching retirement and that’s where I had written in the annuity space and I had written this monograph with the CFA Institute of Lifetime Financial Advice: Human Capital, Asset Allocation, and Insurance. So, it was giving lifetime financial advice, how are you supposed to manage your investments over your lifetime? And when you are young, you got a lot of wage income and actually the present value of what we call human capital. All the present value of wage income you’re going to get over your whole lifetime. And so, that’s almost like a bond, that human capital. So, when you’re young you’re really on your financial capital, have to load up on equities because you don’t have enough equities in your portfolio. And so, young people need to have a lot of equities in their portfolio but as they sat aging, they don’t have that human capital wage income going forward. They have decided replacing their financial capital with something less risky and this is particularly important as they start approaching retirement because these are very sensitive views as you started approaching retirement. It can affect your whole wealth status as you get into retirement. And so, as you start approaching retirement, you really need to de-risk that portfolio and so what that monograph showed that you need to have a mixture of more potentially bond-like investments to that portfolio. [00:11:49] Roger: But as you mentioned, the problem today is that especially with bonds today, bonds today have such low yields. The yields in bond markets are less than 3%. So, bonds have been traditionally the way you would approach this. You would bring more bonds into the portfolio and by the way, bonds have done great over the last decade and really over the last several decades. In fact, interest rates were so high, they were double digits in the early 1980s and a bond return is a combination of a yield plus a capital gain or loss. So, you get that yield and then you get a capital gain if yields drop or you get a capital loss actually if yields rise. But the last 30 or 40 years we’ve had continual drops in these yields. You’ve got these capital gains so anybody who’s been in the bond market over the last few decades have done just great. The problem is potentially as we move forward here. [00:12:53] Brad: Yeah. It’s interesting because I kind of compare it to this teeter-totter and you have the super high-interest rates and inflation in the Jimmy Carter days that as you get to where we are today, now the low, was it July of last year was the lowest that we’ve seen interest rates historically in a really, really long time? I mean, do you remember when we hit rock bottom there? It was within the last year or so, right? [00:13:18] Roger: It was recently. I don’t actually have the dates on that but I guess the key is it’s not likely to go much lower and if interest rates start rising, you’ll get the yield today which is 2% to 3% but you’ll get potentially a loss than a capital loss in the bonds because you’re basically locked in a low yield as yields rise and that means price of the bonds go down. [00:13:44] Brad: Yeah. And so, what’s interesting, I have to throw this out there because obviously a podcast for financial advisors I started in the indexed annuity space in 2007. The product was invented in ‘95 and really I feel like it’s really just hitting the mainstream because if I would’ve talked to an asset manager in the 2007 range and said indexed annuity, they probably hung up the phone. That was about the view of the product back in those days and what’s interesting today though is I still think some of that stigma exists. Being a guy that’s lived in this world forever, can you expand on maybe why is there this image or perception when you look at the math in your white paper, it gets very clear that there’s a huge opportunity here that a lot of asset managers are missing but I feel like there’s this stigma in the industry where they’re still having a tough time getting comfortable with annuities when it comes to asset allocation? Can you hit on or share your thoughts there? [00:14:42] Roger: Well, I mean, there is something legitimate there in a sense that I would say that fixed indexed annuities are not for everybody. They’re really for the long-term investor and the problem with fixed indexed annuities for some investors anyway is you’re actually committing yourself over 9 or 12 years or some contract period and although you have liquidity, you can get out. You have to pay a penalty if you get out early but for the long-term investor, it’s a much more appropriate investment here. So, yes liquidity can be a problem and that’s why I say it’s not for everybody because this is not for the part of the portfolio that you need any immediate expenses and so forth. This is the part of the portfolio that is planning for your retirement. In fact, the nature of annuities is that annuities, this accumulation of annuities can be converted then into payout annuities that pay out during your retirement period. [00:15:42] Brad: And so, I guess I should probably also just at a high level explain what an indexed annuity is because there are multiple annuities out there that exist and oftentimes they get confused. So, you actually do a great job in your white paper right at the front-end, a fixed indexed annuity is a tax-deferred retirement savings vehicle. And then I’m going to share one other little snippet and then we’ll dive in and see where you want to roam around in the white paper. In simulation using dynamic participation rates and uncapped indexed crediting designs, a generic large cap indexed annuity using a large-cap equity index outperforms long-term bonds with similar risk characteristics and better downside protection and you back tested this over the period 1927 all the way through 2016. So, this wasn’t cherry picking best case scenario. This is literally going back a long ways historically. Are there any other things that you would share just about indexed annuities that you uncovered in your research that says how you would define them to the audience? [00:16:38] Roger: Yeah. Well, part of the confusion is annuities really have two general forms. One is the accumulation deferred annuities that we’re talking about here and the other is the immediate or payout annuities that take place during retirement. So, we’re talking about the accumulation stage here. We’re talking about the accumulation. Fixed indexed annuities are a deferred accumulation annuity. They can, of course, be converted to a payout annuity and actually protect against the longevity risk of retirement. Any annuity actually can go through that conversion but we’re really talking about the accumulation stage here. So, that’s what I was measuring here over that period 1927 through, in this case, through 2016, that 90-year period, I was measuring the accumulation of buying a fixed indexed annuity or its accumulation and comparing it to the stock and bond markets. [00:17:38] Brad: Yeah. So, let’s go in. I’ve got a few highlights here and I would love to get your commentary. So, what you did was you back tested over a three-year rolling period, the FIA versus 60% of the S&P 500 uncapped which is there’s a number of products out there today that have similar crediting methods and then like you said versus the S&P and then also versus bond market. So, the first thing and I’m going to hold it up to the screen here, so you can see which section I’m talking about, I found this very, very interesting so it’s actually Page 13 for those of you that listen in and download the white paper. So, there’s this diagram right here, Roger, if you remember that where you basically show historically from 26 through 2016, long-term government bonds versus indexed annuities and the thing that I found very interesting especially how bonds are utilized typically an asset allocation, I think a lot of advisors say, “Hey, we’re going to put some of this. You use a lot of 60-40 allocations in this study so we’re going to put this percentage over here so that if the market has some volatility or dropped, your bonds are actually the safe part of your portfolio.” Well, what your study actually uncovered was 13% of the time at least between 1927 and 2016 they returned zero to negative 5%. Can you expand on the reason behind that? [00:19:00] Roger: Yes. I was comparing annuities to stocks and bonds of course and both stocks and bonds can move money and you are showing up the chart that actually showed that bonds can lose money, and the reason why bonds can actually have negative returns is because you start out with that yield and then you have a rise in yields that leads to a price drop and you have a negative return. So, bonds are risky, and you may think of them as – even treasury bonds are risky. They may not default but because of interest rates change, bonds are risky, and they could have these negative returns. Now, the other thing I should describe about fixed indexed annuity is the fixed indexed annuity is protecting the portfolio, the fixed indexed annuity cannot lose money over any three-year period. That’s what the insurance company is providing here. The insurance company is saying, “We’re going to give you some equity participation, but equities of course mostly go up. They can drop even more dramatically than bonds but if during any three-year period we end up with a negative number here, we’re going to just give you zero or perhaps some low-interest rate here but not a negative number. You will not be able to lose money over any three-year period with a fixed indexed annuity.” That’s why actually it has better risk characteristics than bonds because bonds can lose money and fixed indexed annuities have about the same volatility on the upside but not really on the downside here because on the downside they’re protected here, and they have – you just can’t take any losses here. That’s what the insurance company is ensuring. [00:20:47] Brad: Yeah. Essentially you have that 0% floor, right? [00:20:52] Brad: So, and that’s what, once again for those joining on video I’m going to hold up basically the green chart here. It was really interesting because I highlight the 13% of the time that your study showed that bonds actually lost money over that time period. And on the FIA front, you just eliminate anything below zero and essentially you just added over there to the third column and the math’s almost equivalent. So, I thought that was incredible and I love how you just summarize that in a fairly simple way because that’s a lot of data but two simple charts to show that right on Page 13. [00:21:23] Roger: So, one of the reasons that we get these kinds of results here though on the annuity is we’re showing what would’ve happened with an uncapped annuity where you’re getting participation on the equity market without being capped. Some annuities actually have caps and they might not get those very highest returns to show. If you’re capped, you typically don’t get even higher which has equity participation rate, but you’ll be capped in terms of the high returns. Getting these extra high returns are particularly important though because they ultimately over the contract area are responsible for a big part of the return. [00:22:00] Brad: Hey, Blueprint listeners, I have a special opportunity for you this week. I mean, I wouldn’t interrupt the middle of an interview otherwise. We are hosting for the first time ever at AE Headquarters an event unlike any other that’s taking place May 30 through June 1. It’s completely focused on how you as a financial advisor can make the leap from traditional old-school marketing to the new digital frontier. We’re going to focus on how to break away from old-school tactics and learn what’s working for some of our top clients from across the country when it comes to new strategies on Facebook that are driving prospects to your events and even better, it doesn’t require you to pay for dinner. Here’s a bit of what we’ll cover at the event. First, we’ll have the actual Facebook marketing expert who helped run Trump’s Facebook marketing campaign during the election. I might add this isn’t a political conversation where he’ll be discussing right or left, just doing a deep dive into the tactical strategies that drove results for the campaign. Next, we’re going to have a digital marketing firm that is consistently filling our client’s events with 40 plus prospects per evening. What’s incredible is they’ve only missed this number four times in over 400 plus campaigns in the last three years and all attendees are being invited directly from Facebook ads with an online registration process to attend an educational event with no dinner being served, no direct mail whatsoever being used. They’ll show you exactly how they are doing it including something on Facebook called a look-alike audience which is a tool you can utilize to literally clone your top clients. More on that and how they do it at the event. Then of course, once you get a qualified attendee to actually show up, it becomes about the automated follow-up process you have in place to get them from your event to your office, and then once they get to your office to becoming a client. We’ll have an Infusionsoft expert in to share exact campaigns working today in financial services. And by the way, if you aren’t familiar with Infusionsoft, you should be as it is changing the game for our clients. [00:24:00] Brad: Lastly, we’ll have two of our top performing offices which gathered 233 million and 97 million organically in 2017. They’re going to share their real-world marketing ROIs, how they consistently keep the calendar full, and the key to scaling your firm, so you are no longer a salesperson or an asset manager that has to show up to work each day but rather a CEO. So, if you’d like to see if you qualify to attend, it’s as simple as taking five minutes to fill out a short application online at BradleyJohnson.com/TheCatalyst so we can understand more about your business and make sure that the event best fits you. And for those that qualify, we’ll fully cover your cost to attend including your flight, your hotel, and your tickets to the event. And if you play your cards right, maybe we’ll even crack a bottle of wine or two at my house. You never know. With that being said, this is the first time we’ve ever done an event fully focused on digital marketing, so I promise you it’s going to fill up fast. I’ve actually already seen a few registrations coming in. So, go fill out the application at BradleyJohnson.com/TheCatalyst to save your spot today and I’m going to be looking forward to the chance to meet a few of you face-to-face. [00:27:12] Brad: So, I wanted to share that with you because I want to see, is there anything off base with there? I know that’s not the full story, that’s very high level but what are your thoughts on that simple A/B comparison based on the current environment? [00:27:22] Roger: Well, I have a couple of comments. One on the behavioral aspects which I’ll get back in a second but first on the fee part of this, I’m not really saying there are no fees because the insurance company obviously covered their cost here. And so, these fees are embedded in the insurance price and how much equity participation you get in the equity product. So, there is a fee. It’s not that the fee – and I was very aware of it and that’s why we actually presented everything on a net basis, a net of fees in the white paper. I will say that’s one of the things people talk about is the complexity here or the transparency issues about the insurance products because, yes, obviously, the insurance company has to get paid at some point, but you don’t see it quite the same way. In fact, the fees are really much lower, mostly go away if you hold it over the whole contract period. If you have to get out early, if you want to get out early, you’ll see that fee more directly because you’re going to have to pay a penalty on getting out early. That’s why I say this is for long-term investors who are really using this and planning for retirement because so I’m not saying there is some actual cost actually involved here. There are costs of course but they’re not that high for the investor who actually invests over the whole contract period. And actually, then ultimately, they can convert it to this payout annuity which actually protects against their longevity risk, the other form of annuity. Let me say one other thing about me. [00:29:05] Roger: Because the other part of the question you asked about behavioral, that’s really why we have these kinds of products because they’re really based on behavioral finance. They’re based on what people really want. People are concerned about equity markets, but they also are concerned about the low yields of bond markets. They don’t want to lose money as they head to retirement. That’s their great fear here. These are very important use for them and they don’t want to lose money in approaching retirement. So, from a behavioral perspective, these products are tailor-made specifically meet what people really want and that’s why we have the principal protection here and that’s why we have the equity participation. These are the facets to the product that actually are tailor-made. But once you tailor-make a product that gives people exactly what they want, by its very nature it’s going to be a little more complex and that’s where some of the complexity and the transparency issues come in. But I don’t think that is a bad here. I think of it actually as something that’s actually matching what people really want here. If you tailor-make a product, doing exactly what you want, you have to make it more complex to actually meet their needs. [00:30:22] Brad: So, I guess, we’re really going to move into kind of the return profiles anyway, so I think you’ll probably hit on it here. So, for those listening in that go out and download the white paper, this is Page 16 and 17 and, Roger, I’ll hold it up here for you. The FIA scenario analysis, if you remember this section, this, like I said, you couldn’t have timed this white paper at any more interesting time because the Fed just raised rates and they’ve said I believe they’re going to raise rates three more times. It’s kind of the projected analysis and what you do a great job of here at the bottom. So, Exhibit 11a, rates are unchanged over a three-year period. So, let’s say the interest rate environment does not bump up as the Fed says it’s going to and you do an expected three-year annualized return and you do a side-by-side here. You do a 60-40 stocks and bonds portfolio. You do a 60-20-20 stocks, bonds, FIAs with bonds and FIAs being a 20-20 and then you do a 60-40 were stocks and then you completely swap out the bonds for FIAs. Do you want to unpack the numbers or do you want me to throw some of them out there as far as some of the surprising things you found there? [00:31:29] Roger: Well, I won’t talk specifically about a number. You can throw a number if you like but I’ll just say, in general, when the stock markets are up, you’re getting that equity participation. So, that’s one of the things you’re getting it with a fixed indexed annuity, you’re getting part of the stock market. Now, of course, if the stock market goes down, you may do little worse than the 60-40 portfolio because the bond part might not have the same drop, but you won’t have any losses. That’s the key. You will not have any losses over any three-year period. [00:32:03] Brad: Yeah. It was interesting looking at 11a where interest rates were flat. Essentially, to sum it up and not go in a line-by-line column-by-column numbers, the more allocated to an FIA, the better the return in a flat market, a plus 10 market, a plus 20 market and as you just stated, if the market lost negative 10%, the bond portfolio did slightly better because there’s a fixed-rate that’s attached to it in a negative market. However, as you compare in the next three diagrams so for those of you following along, 11b, c and d you basically do the exact same analysis in an interest rate environment that increases 1% over a three-year period followed by a 2% followed by a 3% and the math comes out pretty clear that the more you allocate to an FIA at least mathematically and statistically, the better your odds are in a rising rate environment. So, what are your thoughts around that and what would you like to share with financial advisors out there that are listening in around that? [00:33:07] Roger: So, when interest rates rise, bonds fall in price and so a person who invests in a lot of bonds would not do very well in that rising interest rate environment. That’s very likely or potentially the kind of environment we’re in right now because we’re starting out with such low yields and they’re starting to rise. So, if that’ll continue to rise, it’s not a good period. So, that’s why I actually put these diagrams in, these tables and 11b, c and d because we’re looking at potential rises in interest rates. That’s the danger here because people are buying bonds because they are de-risking the portfolio but if interest rates rise, those stock-bond portfolios will not do as well as putting in fixed indexed annuities. So, I think that’s the environment we potentially are in here then that’s why it’s so interesting to look at an FIA today. [00:34:04] Brad: As we go into that kind of the viewpoint there, most of our clients are dealing with retirees. And so, if you are a retiree today and maybe even say you got $1 million just sitting there and you’re looking to invest it with the thought process that, “Hey, I kind of need this to be around. This is my nest egg that’s going to drive income for me here over the next 10, 20, 30 years. As you compare the option, option A bond, option B FIA with the thought process that interest rates are looking like they’re probably going to be heading up, where would you be putting your money or what thought process would you have behind that? [00:34:41] Roger: Well, it’s particularly – now once you actually need the cash flow, or even have writers, of course, in this that gives you some cash flow but also that would be the traditional payout annuity, so it gives you the cash flow. This is as you’re building up toward that period. And so, this is really if you don’t need the cash, you can be in early retirement or you could be approaching retirement, this might be appropriate for but once you start needing the cash flow at the end of the contract there, you would convert this with a payout annuity. So, it’s a way of actually getting – actually deferring taxes by the way over the period that during this contract period. So, it’s a way of building up your wealth in this tax-deferred way that’s essentially protecting your principal in this very important period of your life really because if you lose money right before retirement or right before you need these cash flows, it’s very hard to readjust to get back at that point because you’re not earning any income after that. And so, that’s why you really need to protect your financial capital. [00:35:54] Brad: Let’s go there. We had 2017 just happened. It’s behavioral finance 101 when the markets going straight up, everybody thinks it’s always going to keep going straight up forever and so actually we deal in both sides. We also have an asset management firm that’s over $3 billion now and we saw a lot of this happened last year where our advisors were coming to us in saying retirees, 55, 65, 70 years old were coming into the office and saying, “Ah, I don’t really feel that bad about risk. I think I want to allocate most of my retirement nest egg to the market. I mean, shoot, it’s going straight up. I don’t want to miss out on these returns.” And I know that’s something that we’ve hit kind of around here so why does that happen? In your years of studying the market, why does that just happen over and over and over? [00:36:41] Roger: That’s one of the behavioral issues here. People extrapolate and so you have a great market for a few years and they just think it’s going to continue on having a great market. And when you have a poor market, they think that’s going to continue on too. Well, the nice thing about the FIA here is that when you have a great market like last year, you actually get a lot of participation in that great market and you actually get a great return on your fixed indexed annuity. When you have that really poor market, your principal is protected, and you don’t really lose money during that period. So, it kind of protects against the kind of behavioral people extrapolate way too much and first of all, this is a long-term contract, so you can’t just move money in and out. You’ve got to stick with this but actually it works to your benefit because people have a tendency to, and there have been studies have shown this, people have a tendency to change last year’s return and so they get out of the stock market at the wrong time like right after a drop or ride the stock market at the wrong time after a huge rise but those aren’t necessarily the right time to be in a stock market of course. But this is a mixed product with a fixed indexed annuity. You are in the market. It’s just that you’re protected on the downside. [00:38:00] Brad: Yeah. Well, starting out my first year was 2007 so what a year to start out in a financial services business because I’m just a baby in the business and 2008, 2009 happens and I saw exactly what you’re speaking to. I saw 2008, 2009, our business tripled. We were dealing in indexed annuities and at actually the worst time a client could have probably cashed out the bottom of the market like sell low, buy high, that’s not how the advice goes and now I think we’re seeing the other side of that play out where everybody’s buying high when in reality we don’t know what the market is going to do. We do know historically this is one of the longest bull runs in the history of the US. So, yes, probably getting a little long in the tooth but right now you would think people should be saying, “Hey, I’m actually recovered from ‘08, ‘09. It’s time to maybe take some of the chips off the table.” As you stated, the FIA still gives them a lot of the upside participation in the market but then protects against the downside. So, if you are a financial advisor, how would you start to walk a client through the thought process when you know you’re dealing with just human greed? I mean, that’s just the human psychology of wanting what’s going up. So, any advice there for financial advisors? [00:39:18] Roger: Well, let me say upfront here that I think the key to distributing fixed indexed annuities is having a trusted financial advisor because we don’t want an advisor who’s going to put you in this contract and then take you out and you end up paying penalties and so forth. We want the advisor to match people to really the long-term investment who really is preparing for retirement. That’s who should we be buying this product. And so, it starts with having that trusted advisor who in fact is working in the client’s best interest here. They’re not just trying to get permission of some sort or something. They’re really actually trying to meet the retirement needs of the investor. So, it’s very important that you start with that trusted advisor. Now, the other part of this is education. I guess, that’s one of the whole purposes of the white paper is really to help educate not only the end-user but of course also the advisors here to what is the nature of a fixed indexed annuity so that the more we can understand that and these are one of the issues that it is a little bit complicated when you make that tailor-made product that is perfectly, I guess, designed to meet the needs of the investor but becomes a little bit complicated. Here, we got to educate the advisors so the advisor understands the product and ultimately, that trusted advisor can serve the clients, ultimately building up for their retirement and then eventually converting to protect against their longevity risk. And I think what your white paper will do is open a lot of eyes as a true option as a fixed asset class that has a place in a portfolio for a retiree. And so, I just want to thank you because I think there’s a lot of people that have probably not really given the indexed annuity a chance but this white paper when they actually take a second look at the math and take their emotions out of it, they’ll really see, wow, this has a place in the portfolio for the right clients. So, is there anything, as we kind of wrap the conversation on the white paper that I didn’t hit on that you want to bring into the conversation before we move on to another topic? [00:42:10] Roger: I think we’ve hit on the main points and the key is that however we want this, it’s not for everybody but it’s for the investor who actually is actually preparing for retirement who has a longer-term outcome. [00:42:23] Brad: Perfect. So, as you look out over the next few decades if the caution around just bonds and what’s going to happen as interest rates climb, let’s say I just completely ignore that as either as a financial advisor or as a retiree, what’s the danger there? [00:42:38] Roger: Well, the danger is just poor returns on you thought you were de-risking, but you end up with poor returns in the bond portion of your portfolio. That was shown in the tables and so forth. You end up with really not very good results and it’s kind of extreme to say this, but you potentially end up jeopardizing your retirement. [00:42:57] Brad: I think that is scary and it’s actually a huge statement most advisors aren’t – I would say most. I mean, that’s a broad generalization. I’d say a lot that there’s a blind spot out there because I think there’s just kind of as you look back, if you’ve been a financial advisor since the Jimmy Carter days, you’ve been a financial advisor during this probably the most massive bull market in the history of bonds. Is that fair to say? [00:43:23] Roger: Yes. It is fair to say and that’s why for those of us who we shouldn’t be extrapolating bond returns but many people naturally do, they say, “Well, bonds have been great for me over the last few decades.” As you say not quite since, not really, just about through Jimmy Carter. After Jimmy Carter they were basically great for really the bonds peaked out in 1981, at early 1981 so since then bonds have been great but we’re really talking about the future and, yes, they’ve been great for the last few decades. That’s sort of why we would look at fixed indexed annuities today rather than say a long time ago because actually, bonds were sharing this purpose. They were de-risking the portfolio. They started out with a high-yield and, yes, they may have had capital gains and lost and it turned out they had mostly capital gains so they not only got that high yield but they got a gain from the drop in interest rates. So, they just did very well over this period of time. It’s not an accident that we got interested in FIAs today though because the difference is today’s yields are so low and they’re not very likely to keep dropping and really, I guess the best estimate is that you kind of get the yield and you sort of could get less than that from the capital loss on these bonds. [00:44:44] Brad: So, maybe this is a silly analogy but I’m just trying to think how do you explain this. It was almost like bonds were Michael Phelps swimming with the current. They were doubling up. They were a good product, but they also have the addition of an interest rate that just dropped over a 20 to 30-year time period. So, you put Michael Phelps in the Amazon swimming with the current, he’s going to swim really fast but as we look at the future, flip him around and now he’s swimming against the current where interest rates are climbing, it’s going to slow down his times a little bit. That’s kind of what we’re talking about with bonds right now, right? [00:45:17] Roger: It’s even strong than that. That’s a good analogy but just like Michael Phelps swimming with the current and then turning in and then replace him with a low yield swimmer like myself swimming against the current and so, the returns are going to be totally different. The speed will be totally different between those two things because it isn’t only the current which is affecting the yield in your analogy, I’m sorry, the change in the yield I guess, because you’re getting the benefit of dropping it but you’re also starting with such a slow swimmer I guess. You get that combination, they’re not likely to do that well in bonds in the future. So, we’re at kind of an inflection point there and we’re just looking at other ways of trying to accomplish our goals as we approach retirement. [00:46:08] Brad: So, you just made me think we’re going to – have you seen the video where Shaq races Michael Phelps in the swimming pool? It was a special like probably three or four years ago. [00:46:18] Roger: I haven’t seen that. Shaq must have big strokes. I don’t know. [00:46:22] Brad: Let’s just say he gets crushed and so what I’m going to do, I’m going to put that video in the show notes because we threw that analogy in there so thanks for expanding on that. I did not know the conversation was going to go there but I’m glad it did. So, as we wrap the conversation here on your side, Roger, I would love to just ask you some more philosophical questions and to kind of what’s led to your success and things like that. Are you good for another 5 to 10 minutes? [00:46:47] Brad: Okay. Let’s do it. So, I have to ask this one. As I’m thinking what do I ask Roger, so a guy that – and before I get there, before 1977, before you founded Ibbotson Associates, what was your experience before that? Were you also in finance? [00:47:05] Roger: Actually, I was a bond portfolio manager. I was a bond portfolio manager. While I was getting my Ph.D. at the University of Chicago, I ended up managing the university endowments bond portfolios. So, I’m pretty familiar with bonds. That was my first job really in the financial field, managing the university’s bond portfolios. [00:47:26] Brad: Wow. So, these are really strong statements based on your background then. [00:47:31] Roger: Well, it makes me understand bonds. And by the way, bonds are mostly mathematical but when you get into individuals here in how they behave, that’s where behavioral finance comes along and that’s something that I guess I picked up later throughout my colleagues at the universities here particularly at Yale, for example, Yale University where I’m a professor. So, there we’re trying to understand how people behave. So, part of the story is mathematics, but another part of the story is how people behave. [00:48:02] Brad: Have you happen to cross paths with a guy named Dr. Daniel Crosby yet? [00:48:06] Roger: No, I’m sorry. I haven’t. No. [00:48:08] Brad: I need to introduce you two. You would get along well. He was on a couple of episodes ago. He is a behavioral finance guy. Okay. So, I have to ask you this. Being a guy that’s essentially dedicated your whole life to money and finance, I’m curious if you think way back, would you be open to sharing your first memory of money? [00:48:28] Roger: My first memory of money, well, I probably shouldn’t do this but essentially, I bought some stocks when I was very young, and they did very well, and I end up making more money and those stocks that I did doing my summer jobs at the time. [00:48:46] Brad: What did you buy? [00:48:48] Roger: Well, I bought like the Ford Motor Company for example and Ford Motor Company had just gone public shortly before that but it dropped in price eventually and then I thought, well, it just had gone public the year before and I think it was 56 or something and it fallen to 32 and this is the 1950s and I thought, “Well, I don’t know much about markets but why it was at 56 and now at 32?” and I just bought some. Now, I admit I didn’t know anything and I did well and that got me interested and I learned of course over time that making money isn’t that easy, but I guess I was lucky in the early days. It’s better than being lucky at a gambling casino though where you get lucky and you get addicted to gambling. I got addicted to something an interesting field that has all kinds of potential that really helps people. [00:49:42] Brad: Yeah. I think it’s served you okay. I mean, I think you did all right in this field. So, how old were you? Do you remember? [00:49:48] Roger: I was I think 16 and when my father had bought stocks for the first time because he brought up, come up in the Depression and people are afraid of the stock market and none of his friends bought stock and he’s out buying stocks and so I had a uniform gift, a minor’s account at the time. We had a [inaudible] because I was a minor, I couldn’t buy the stocks but I started buying stocks because I was always saving money myself. So, whatever money I dug up, I would save for my summer jobs and so forth. So, anyway, it got me very interested in the financial markets. [00:50:19] Brad: So, your dad really he kind of ushered you into it because he would’ve had to sign off for you buying stocks. [00:50:39] Brad: This will be fun. We have a lot of younger financial advisors that listen in here too. The process of buying a stock back in those days, how did you go about doing it? [00:50:47] Roger: Well, because I had to go through the – I was a minor so you went through a broker, but I had to do it through my father, yes. I couldn’t buy stocks as a minor. [00:50:57] Brad: So, did you have to literally drive over to the financial advisor’s office or the broker’s office and sign papers to buy stocks or what did that look like? [00:51:05] Roger: I think you could do this over the phone after you set up your account. [00:51:08] Roger: I mean, I’m not that old. We had telephones in those days. [00:51:15] Brad: When you hear the word successful, who’s the first person you think of and why? [00:51:19] Roger: I think Warren Buffett would be a good answer here but essentially what Warren Buffett has done is invested long-term and we’re talking here about making long-term investments here. He’s also trying to invest in companies that had strong fundamentals. It’s something that I typically do here. And in particular case, actually, we invest in stocks that are less popular, stocks that are more overlooked, and I think that’s something that Warren Buffett does too. I don’t literally copy him of course in any way but he’s an example of somebody who’s actually had great success in the capital markets. [00:51:57] Brad: Have you and Warren cross paths over the years? [00:51:59] Roger: Yes. A couple of times, yes. I mean, I’m not trying to be his good friend or anything. [00:52:04] Brad: You have any good Warren stories or wisdom that he shared with you over the years? [00:52:08] Roger: Well, I don’t think I’ve had enough contact with him. I have only public knowledge of mostly what he says. I mean, he gives talks and things, but I wouldn’t say that he is my mentor. I would say that he’s a person who has that long-term outlook which I definitely share. [00:52:29] Brad: For sure and he’s definitely a guide that going back to our analogy of swimming with the current, he makes very smart decisions at the right time that are not emotional-based whatsoever. I remember reading an article back in ‘08, the Goldman Sachs deal that he brokered when nobody had liquidity and he had liquidity, so he got a really good deal but ended up pretty well when all these financial institutions were basically on death’s doorstep. So, just a smart guy all around. [00:52:54] Roger: That’s certainly one of the approaches that I’ve always had to investing and now I write actually a lot on popularity, actually buying the less popular stocks and avoiding or even shorting the popular stocks because those stocks tend to be overpriced. [00:53:10] Brad: Well, I’m prepared. I’ve got it right here. I told you I did a lot of research for this conversation, the whole Zebra index, I mean that’s a big piece of how you build it, right? [00:53:19] Roger: Yes. That is how we actually build products here that we actually avoid the hot stocks because those are the stocks that actually, if anything, tend to be overpriced and well, I would say we totally have to, I don’t like to call it unpopular, that’s why we call this cool stocks. We actually go out after the cool stocks here, but those cool stocks actually were the – those are the overlooked stocks, those are the stocks that actually have the more attractive prices. [00:53:48] Brad: You titled it the politically correct way, right? [00:53:52] Brad: All right. So, someone that’s as studious as you, you have to have a book or two that’s impacted your life over the years. So, my question is, what are those books? What have you taken from them? Or is there a book that you’ve repeatedly gifted over the years that you could share with everyone? [00:54:07] Roger: I have to admit, I’ve been writing my own books and so I’ve written enough of my own books that those are the ones that I’m passing out of course. The one that I’ve really come out is an annual is Stocks, Bonds, Bills, and Inflation and which gives all the historical returns and analyzes the risk-return characteristics to the markets. So, it’s not that I don’t read other books. Of course, I do but I have to admit that as an author, I’m really writing a lot of my own books. I’m writing a book right now actually, a monograph for the CFA Institute again which is called Popularity: A Bridge Between Classical and Behavioral Finance. So, that should be coming out this year and it talks about popularity, it talks about classical finance of course, and it talks about behavioral finance and how these are all kind of linked together. So, when you really talk about finance as this whole package here and I believe that popularity is a way to actually link everything together. [00:55:12] Brad: Well, let me know as soon as there’s a preorder link, we’ll throw it in the show notes, get you some sales. Sound good? [00:55:27] Brad: We’ll at least spread your message, right? We’ll get your message out there. [00:55:32] Brad: And by the way, just a complete aside but you may have the most expensive book on Amazon because your 2017 guide as it’s called I think the acronym where it’s SBBI so the Stocks, Bonds, Bills, and Inflation Yearbook it’s like $150 or something so you know it’s a good book if you have to pay that much to get it, right? [00:55:52] Roger: Well, that’s what classical economic says. Yes. [00:55:55] Brad: You’re using some behavioral finance in the book pricing, right? Okay. So, I’ve got two more questions then I’ll let you get on to the rest of your day. I’m super appreciative, Roger. This has been a really fun conversation. The first one, is there something that you would like to see considered absurd 25 years from now? [00:56:16] Roger: Of course, I have made long-term forecast often and actually back in 1976 I forecasted the market would hit, that the dollar would hit 10,000 by 2000 and it did so I’ve made those kind of 25-year forecasts in the past and so I’m saying it’s not absurd. I would generally project something like we’ve had over the last say 90 years going forward. What’s different is we have low inflation rates today, so I don’t actually think we’ll get the 10% return that we’ve had over the last 90 years in the stock market. That would be absurd in the sense that we need so much inflation to get it, but I do think we’re going to get the kind of premiums and risk premiums in the market. We’re going to get very high returns long-term, very long-term in the stock market. Most people don’t have the patience for that 25-year horizon you’re talking about, but I don’t think it’s absurd to think that I think it’s almost for sure that we can think that stocks are really likely to beat bonds over the next 25 years. What would be absurd is if bonds beat stocks over the next 25 years. That would be absurd. By the way, over the last 25 years, bonds almost met stocks, but it would be absurd if they would get close to the stocks over the next 25 years. [00:57:41] Brad: It would be absurd if Roger Ibbotson swimming beat Michael Phelps is what you’re saying, right? [00:57:46] Roger: Yes. That would be a thing too. I guess it could happen if Michael Phelps ended up drowning in the pool or something. [00:57:54] Brad: How much of that plays into the baby boomer demographics as well? Obviously, the boomers fed a lot of the economy in the 80s and 90s. Where do you see that playing in? Do you have any thoughts around that? [00:58:06] Roger: Well, that isn’t necessarily helpful to the stock market because we get much more retired people over time as a bigger portion of the investors and they have to start de-risking their portfolio. So, that would probably argue for lower returns. But I can argue that it’s all in kinds of the sides of this because, for example, the world just speeds up over time and so that’s an argument for higher return, so we could have higher returns or lower returns. I could make a list on both sides of this I guess as what returns should be. The biggest piece though is inflation. Inflation gets built into returns. Over the long-term, it gets built into the stock returns and in particular, inflation gets built into that bond yield. Right now, we have almost no inflation and that’s why the bond yields are so low. If we actually got some inflation in the future and we could easily have, you know we’ve had very high inflations at different periods of time. We actually got inflation. Those buying yields are going to really shoot up. [00:59:09] Brad: Interesting. Okay. Last question. What is the one piece of advice that you could share with the audience that’s led to your success to this point, Roger? [00:59:18] Roger: Well, for me, it’s always been a combination of I actually think education and academics are a lot to contribute. For me, it’s always looking out what’s going on in the academic world, contributing to it, but turning around and applying it is much as possible in the real world. And essentially, this involves teamwork on everybody’s part because we rely on our academic community and our firm, Zebra Capital, and we rely on our team to actually build these things. We rely on other firms like your firm, Annexus and Nationwide and so forth. In order to actually make things work, you actually have to put things together multiple players in different size have to work together. Now, I’ll give you the downside. One of the things I’m a little worried about frankly right now is trade wars because that’s sort of the opposite of teamwork here where countries may be getting in battles with each other in different forms. [01:00:19] Brad: Yeah. That’s been in the news a little bit here over the last couple days, hasn’t it? [01:00:24] Brad: You never know what tweet you’re going to wake up to. It’s always an interesting day. So, well, Roger, thank you so much. Super grateful for you carving out the time and especially there’s going to be a lot of financial advisors all over the country that are going to benefit a ton from this. So, thanks for the work you do. Thanks for the work that you’ve done over the years and you have to be proud. I’m 37 and it’s just an honor to sit here and learn from you in this conversation because I see a guy that through your work, through the education and through the authoring of all of the work that you put out, you’ve impacted a number of retirees all through the country so it’s very inspiring to me so thank you. [01:01:01] Roger: Well, thank you, Brad. It’s certainly been great talking with you and I appreciate the chance to talk to your audience. [01:01:07] Brad: All right, Roger. Take care. Until next time. [01:01:14] Brad: Thanks for checking out the latest show. I really appreciate the reviews as it helps me figure out which guests resonate with you all and helps the show get discovered. Here are four more recent reviews. The first one comes to us from user Max Filbeck who says, “Great for Aspiring Advisors. Great job, Brad. I’m a student making way for my career as a financial advisor in the springtime. This podcast has set up a great foundation and is helping prepare me for the adversity I may encounter during this long journey. It has help fuel the fire for why I chose this career and how I will be better able to assist my clients.” Max, thanks for the review and for the kind words. It’s fun to see reviews from a mix of industry veterans as well as those who are just starting out like yourself. Some words of advice to live by, focus on always serving your clients first and success will follow. I promise. Good luck on your journey. The next review comes to us from user Jeef33 who says, “Consistently Excellent and Great Variety. I have been listening for a while and have really enjoyed the variety of guests and the way that Brad guides the interviews. I love the mix of topics focused on the business side combined with those on personal development and success away from the office to help us live complete and balanced lives. Really enjoyed the episode with Jim Sheils as that topic is one that I have been wanting to really implement for this coming year. Keep up the good work!” Thanks for the kind words and taking the time to leave the show a review. Jim Sheils Family Boardroom Framework has been one of the best things I’ve ever done as a dad. So, I love that you’re running with it. From my experience, the biggest key to success I’ve found is to simply schedule the first meeting on your calendar and once you do one, you won’t stop. It’s such an incredible experience with your kids. Good luck. Drop me an email to share a feedback once you’ve done them. [01:03:02] Brad: Next up is rweichman who says, “Great Podcast! Love the podcast. Every episode provides a lot of great information. Enjoyed the episode on process versus product. It really gets you thinking. Wish the podcast was weekly!” Thanks for the review. The Process versus Product episode consistently ranks as one of the show’s top three most downloaded episodes so glad to hear it got you thinking as well. This as a framework we’ve really helped our clients from all over the country implement, trademark, and really integrate into their appointment process to give them a competitive advantage and keep them from being a commodity in their own market. So, if any of you are listening in out there and need help with this, first off, go check out the episode, Process versus Product, and if you need help, hop out to the website and hit the Work with Us button at the top of the page. If you’d like to apply for a coaching session, focus on that and we’d be happy to help. The last featured review of the week comes to us from Perry Dufresne, hope I got that right, who says, “Great tool for advisors. This podcast has become a staple addition to my morning commute. Thankful for the ideas and insights that get shared!” Thanks for listening in, Perry. Love that the show’s a staple to the morning drive to the office. Appreciate you taking the time to leave us a review as well. As we wrap this show, I just have to say that I love reading each and every review so thank you, thank you, thank you for taking the time to send the love via the internet. For those of you that have interest in diving deeper or figuring out how you may be able to have our team help you implement many of the ideas shared on the show, my day job happens to be consulting financial advisors from all over the US on how to grow their business and design a practice that serves them versus being a slave to it. Yes, it’s possible to grow your business and work less. This is a model we’ve replicated over and over in markets all over the country. [01:04:49] Brad: So, if you’d like to apply to see if it makes sense for us to have a one-on-one conversation, you can do that at BradleyJohnson.com/Apply. It takes about five minutes to fill out the application, so we can understand what your business looks like, what challenges you may be facing, and how myself and my team may be able to help. We then dive into a discovery session where we ask a lot of questions, we do a lot of listening, and take a lot of notes to see where we may be able to go from there. Take the first step. It’s as simple as applying at BradleyJohnson.com/Apply. So, that’s all for this week. Thanks for listening in. We will catch you on the next show. [01:05:25] Brad: Thanks for listening to this episode of the Elite Advisor Blueprint. For access to show notes, transcripts, and exclusive content from our show’s guests, visit BradleyJohnson.com. And before you go, I’ve got a quick favor to ask. If you’re liking the podcast, you can help support the show by leaving your rating and review on iTunes. Not only do we read every single comment, but this will help the show rank and get discovered by new listeners. It really does help. Thanks again for joining and be sure to tune in next week for another episode. This is provided for informational purposes only. Producers are ultimately responsible for the use or implementation of these concepts and should be aware of any and all applicable compliance requirements . Results from the use of these concepts are no guarantee of your future success. Although, we consider “Fixed Index Annuities; Consider the alternatives” to be reliable, Advisors Excel cannot guarantee the accuracy and completeness of the whitepaper.